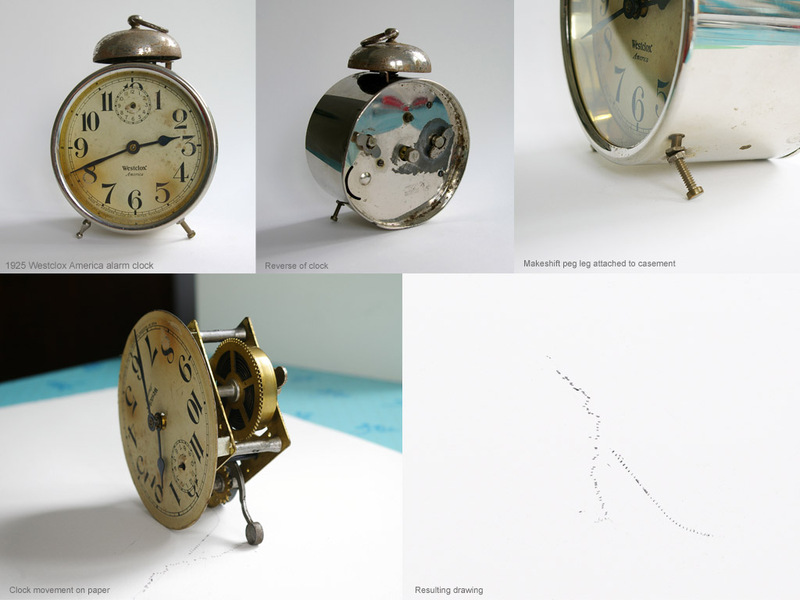 I collect old wind-up alarm clocks, and in 2009 I began to make drawings using the energy found on the clock springs. The first drawing in the series was created using a 1934 Westclox Big Ben Chime Alarm, which I purchased at a yard sale at an old farmhouse west of Kingston, Ontario. The clock was in near-perfect condition, but was over-wound by the owner and then set aside. Years later I discovered the clock in a drawer during a yard sale. As it was a women’s style clock, I will conjecture that it was the wife of a farmer who posited that energy in the spring of the clock sometime in the 1930s. 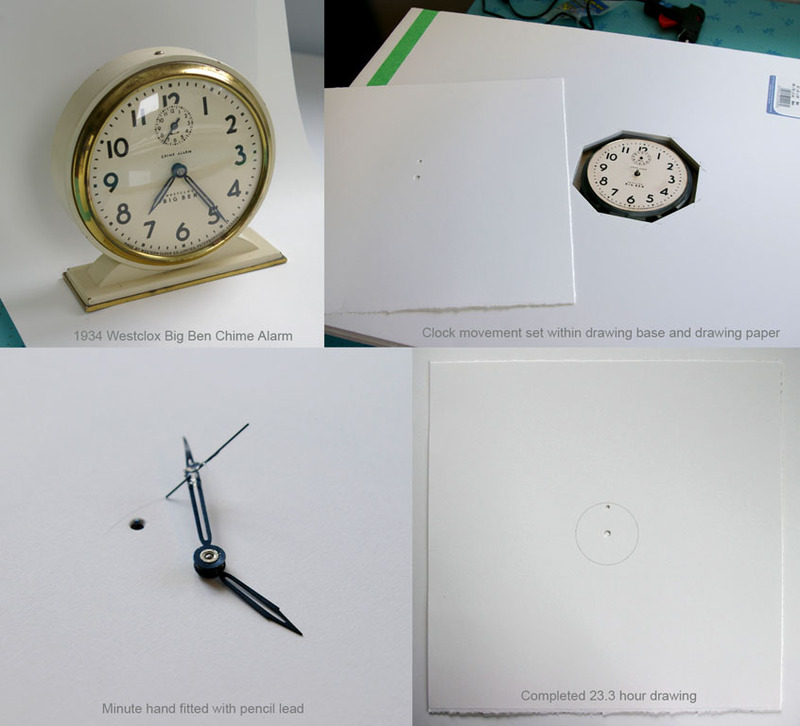 To direct the energy onto the drawing surface, I partially disassembled the clock and prepared a piece of paper to fit over the face. I then rocked the movement until it began to tick, fitted the piece of paper and replaced the hands of the clock. Glued to the minute hand was a small pencil lead. Powered by the winding motion of a woman’s hand some seventy years ago, the lead was dragged across the surface of the paper for a period of 23.3 hours. The drawing is a record of that energy as it slowly dissipated. What I find compelling is that the energy stored on that clock spring was likely the last kinetic trace of the person who wound it. Simply put, it is a new drawing by someone who passed away a long time ago. Inspired by this first experiment, I then searched through my collection of 256 alarm clocks for other clocks that were either over-wound or broken in such a way that energy would have been stored on their clock springs or alarm springs. Only about 5% of the clocks possessed this potential. If energy was found on the clock spring, the energy was transferred onto the drawing surface in the method described above. If energy was found on the alarm spring – the spring used to power the alarm bell – the clock movement was set atop a piece of carbon paper and then the alarm spring was released. The hammer would rapidly strike the surface and make a mark. Each clock had its own particular temperament. Getting a clock to run or convincing it to give up the energy bound on its alarm spring often required a specific apparatus. As a result, the weight of the drawn lines and the size of the paper vary considerably. Each drawing is accompanied by a one-page account of the drawing process and my suppositions about the respective clock owner’s circumstances. Each Clock Drawing occurs as a rather ghostly elegy of a life once live. Watching these drawings being generated while sensing something of the owner’s life, I could not help but be moved, and occasionally chilled, by the process and the result. I have an old, copper alarm clock made by Veglia in Italy. While I do not know who owned the clock, I do know who last serviced it. Written on the inside is “Bill Tets, February 15, 1939.” Typically, a clock repairman will scratch a service date on the outside/rear of the clock, but not wanting to mar the surface of this charming old clock, he wrote in pencil on the inside. Although clean and in otherwise good condition, the clock does not run, so, despite Mr. Tet’s best efforts, it is probable that the clock functioned for only a short period after he serviced it. And since a good clock repairman winds the clock before returning it to the customer, there is a good chance that the energy stored in the alarm spring is that of Bill Tets. I removed the clock’s movement and placed it on a piece of carbon paper. I then released the spring of the alarm causing the hammer to rapidly hit the carbon paper. So vigorous was the hammering that the movement dragged itself across the paper for a short distance. That energy was possibly the last of Bill Tets, clock repairman. This 1925 Westclox “America” had been in service for many years. At one time hobbled and then fitted with a makeshift leg, this veteran of the Depression Era was so well used that the nickel-plating around the winding key is completely worn away. Curiously, both the alarm setting knob and the corresponding hand are missing, effectively disabling the alarm. Perhaps the owner woke naturally at the same time each morning and had no need of an alarm or perhaps there was just no reason to get up. There is no service mark on the clock and a clockmaker would have had a more suitable replacement leg, so it is reasonable to assume that the owner himself made the repairs. Despite the alarm being disabled (or because the alarm was disabled), the alarm spring was still partially wound. I removed the movement, placed it on a piece of carbon paper and released the spring. 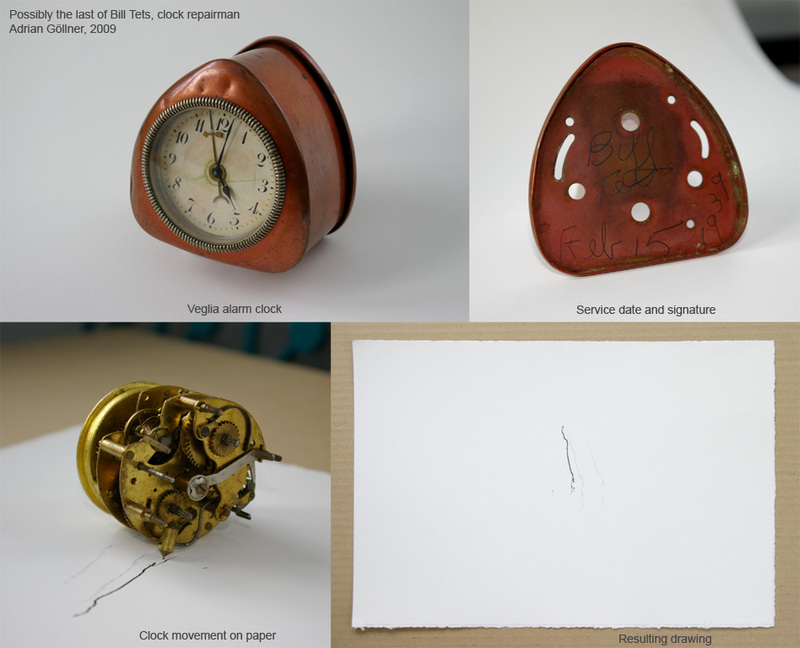 The alarm hammer thumped the surface, while the cogs of the alarm spring bit the paper and pulled the movement forward in an ungainly, limping motion.